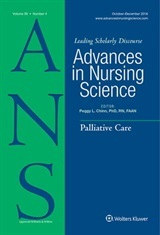 scholarly journey, and (I think) under-appreciated in nursing philosophy. I first came across her paper on “Practical Discourse” when I was in my BSN program, and I remember being just knocked over by it. I literally carried around a photocopy of that paper for years, heavily annotated, underlined in multiple colors. That paper both confirmed my thinking on some points, and profoundly extended it on others – I discovered a whole world of new resources (I had a similar experience a few years later when I read June Lowenberg’s paper, also in ANS, on “Broadening the Dialogue” – both “yes, yes!” and “Huh!”). When I was in a master’s program, and exploring in more depth the philosophical resources in the nursing literature, I found a lot of small, scattered pieces that I liked, especially in the areas of feminism, critical theory, and Continental philosophers – but also a lot of conservative, deeply entrenched, and frankly not very interesting ideas about philosophy of science. One day I worked up the nerve to call Jan Thompson on the telephone (this was before email), and by some miracle she was actually in her office at that moment. After I gushed and babbled for a few minutes, she said, “Well, we’re having a conference here in the fall, and there will be a lot of people I think you’d like to meet.” So she sent me a brochure, and I came out to Portland, Maine that October, and that was my first Feminist and Critical Perspectives in Nursing conference. I did in fact meet a lot of people there, and at subsequent conferences, who became incredibly important friends, teachers, and colleagues. Re-reading these early papers of hers was an effort both to go back to some (to me) foundational texts, and to re-imagine the context in which they were written, and then also to pull those ideas forward, and to think about their significance in the context of today. That is (not coincidentally) the central project of hermeneutics: to make a bridge between there and here, authors and readers. Thompson is a very deliberate, very organized writer, so it was a deep pleasure to re-trace her steps, to work through her arguments again, and to reconsider them in light of later experiences and readings. One piece of her work in particular seems of great salience today, which has to do with the duality of interpretation, what Ricouer calls faith and suspicion. A great deal of qualitative research in nursing has been hampered (to my mind) by too narrow a view of interpretation and experience. Despite the work of Lowenberg, Sandelowski, and others, we have been constrained at times by a perceived obligation to focus only on what participants say about their own experiences. This has too often resulted in work that is unfortunately shallow and bland, neither as messy nor as interesting as actual people. A deeper understanding of the hermeneutic tradition, such as Thompson provides, gives us a way to be respectful of what people say, mindful of the dangers in disregarding that, and also open to the complexity, contradictions, and ambivalences. As I read her, she urges us to listen carefully, and also to listen critically – to hear what people don’t say, as well as what they do. If we are to consider the taken-for-granted assumptions of others, however, we must also consider our own – to locate ourselves in the world, and to notice (as best we can) the ways those locations influence our pre-understandings – so that we can try to be more fully present with and to understand other people. It is perhaps that sense of philosophy as a way of being in the world with other people that is most central to what I gain from Jan Thompson’s work. Philosophy in this view is fundamentally about how we live, about being in a world that is both messy and amazing, personal and political, profoundly puzzling and worth thinking about. It is a great pleasure to take part in, and to extend to others, the continuing conversation that is nursing philosophy.